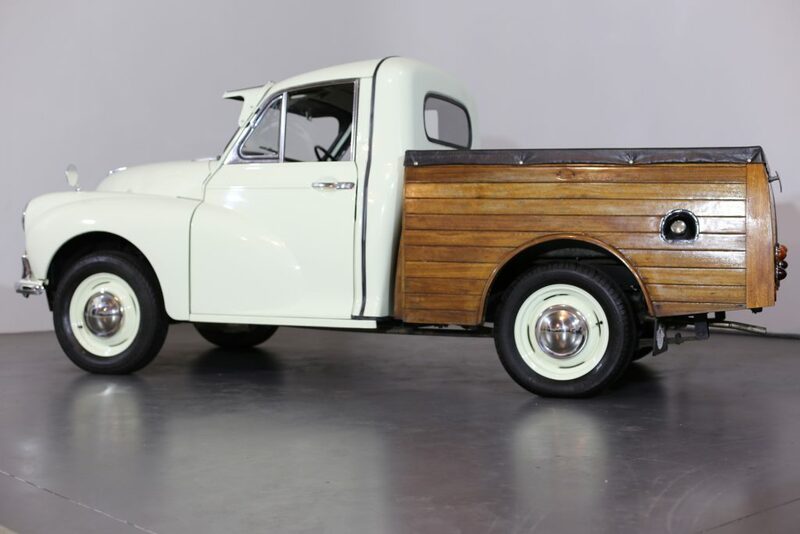 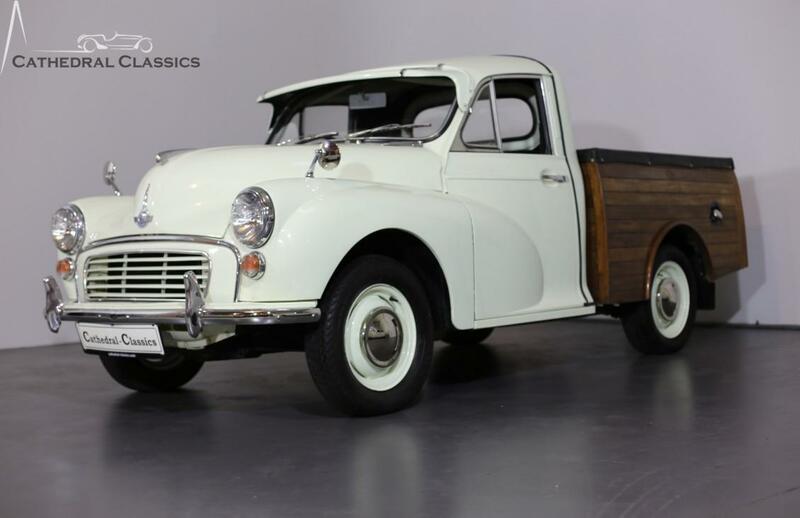 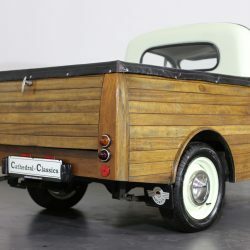 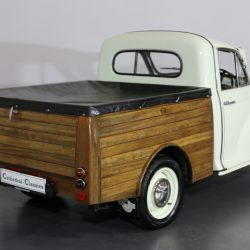 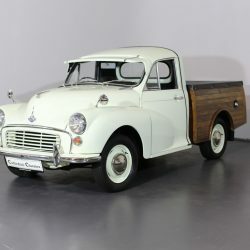 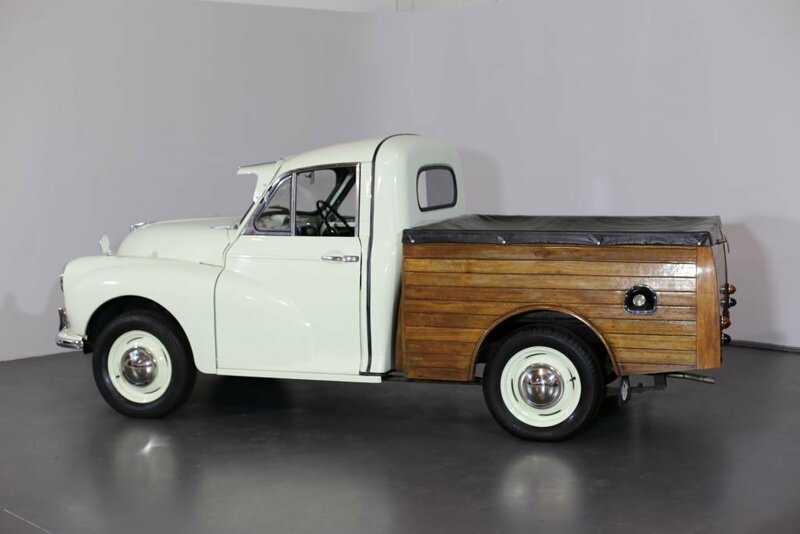 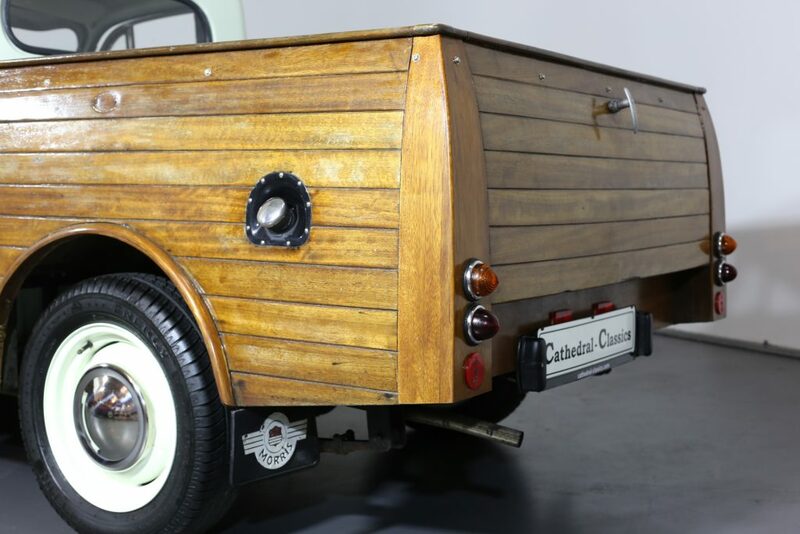 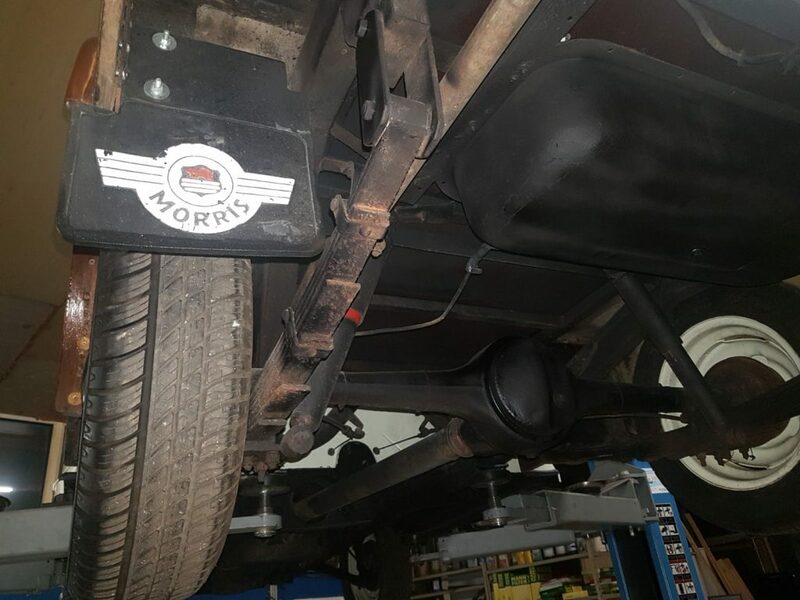 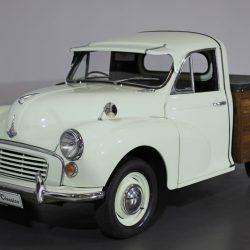 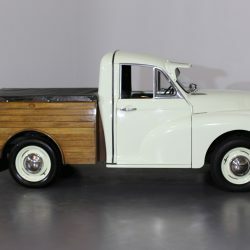 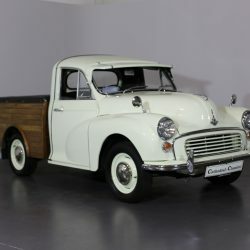 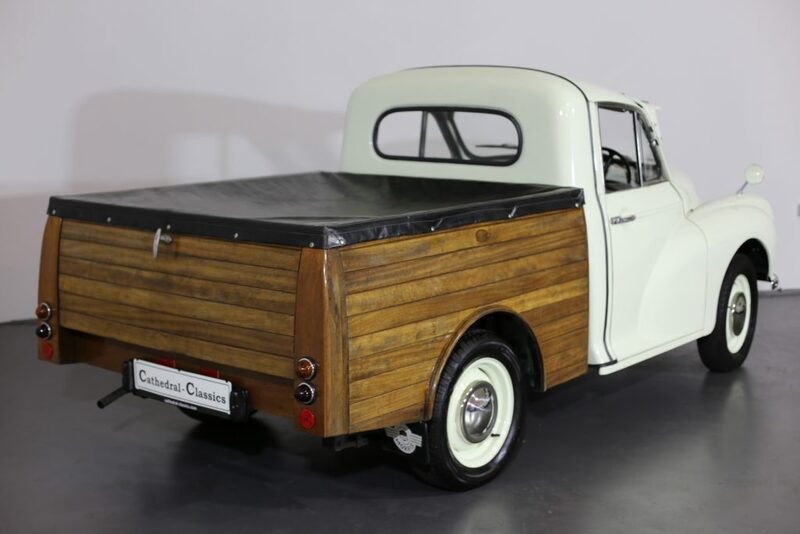 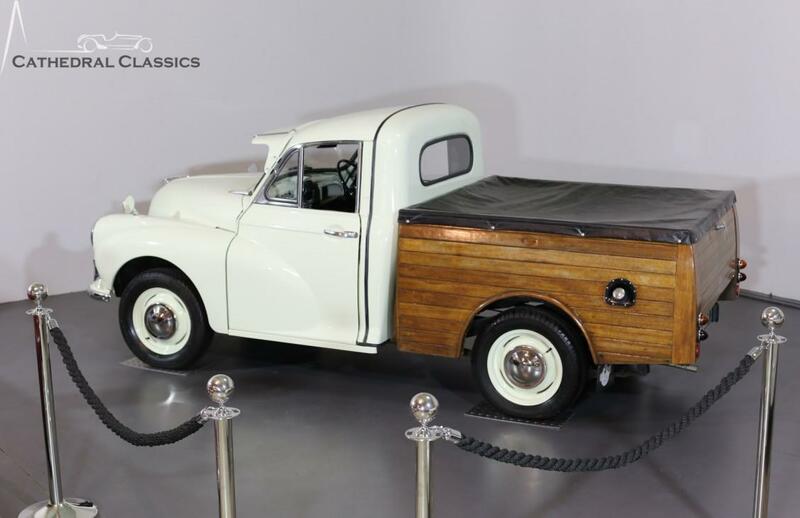 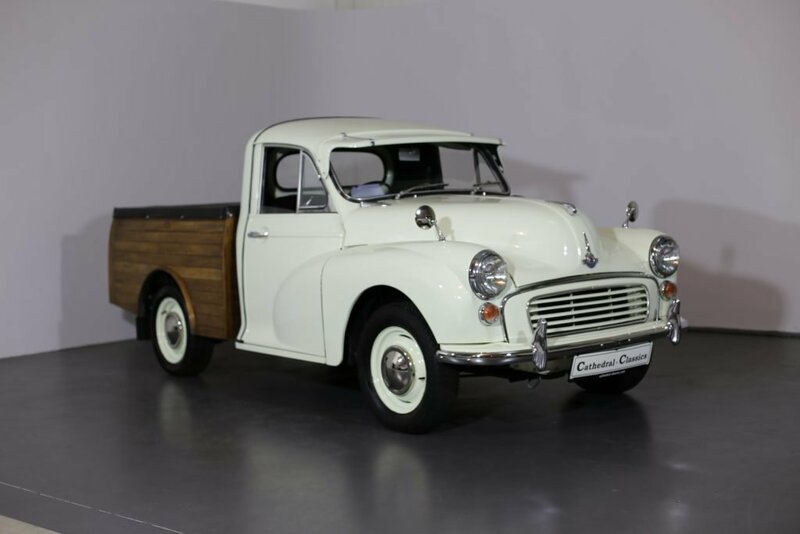 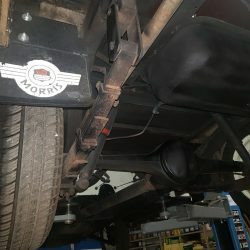 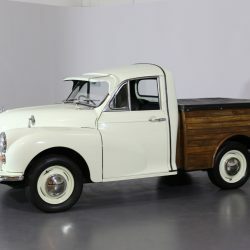 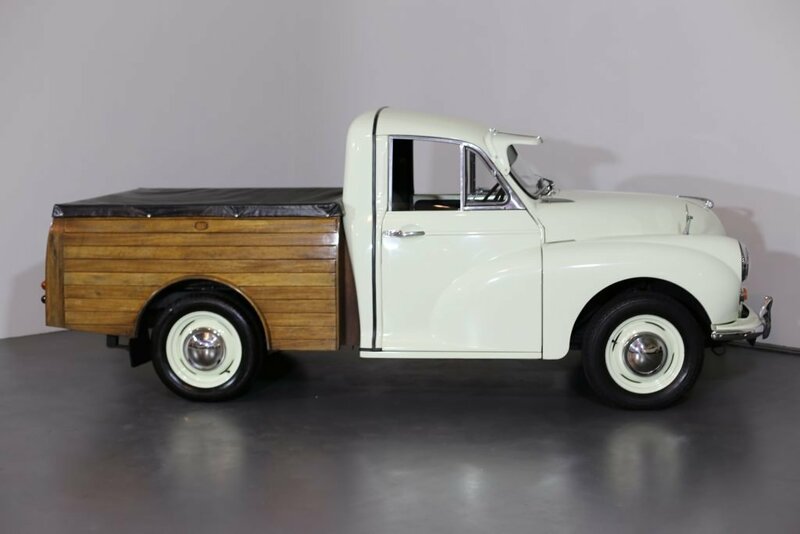 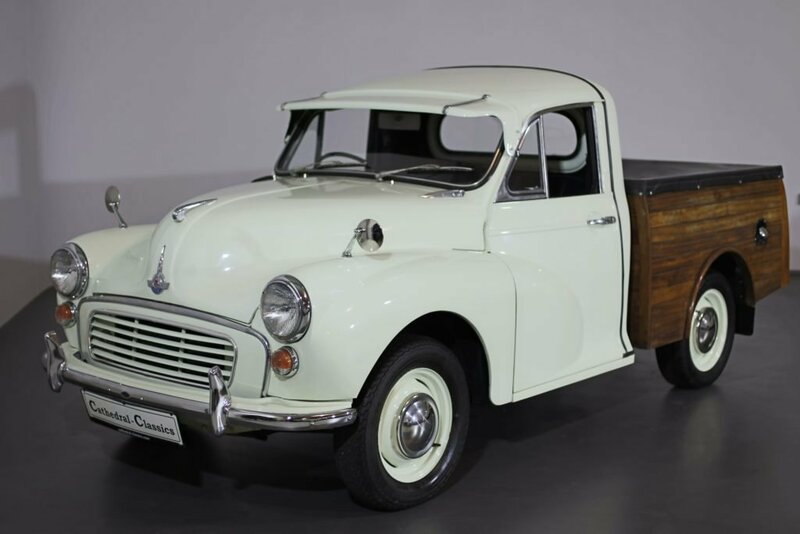 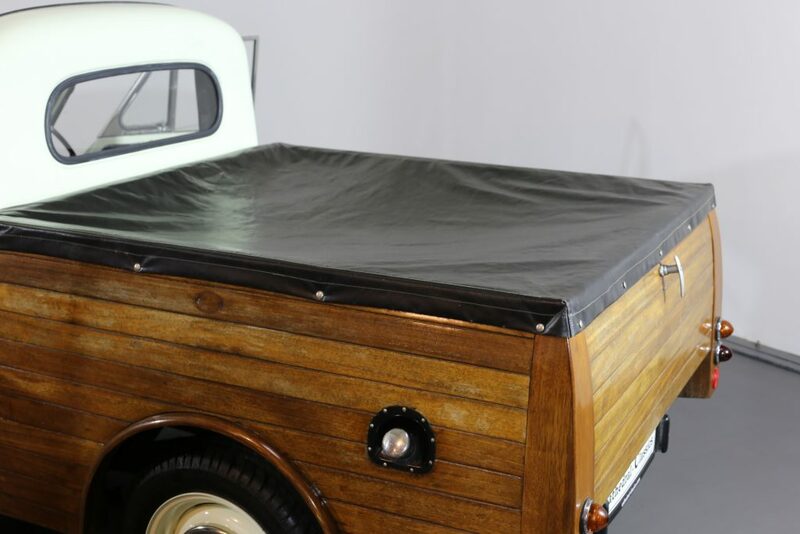 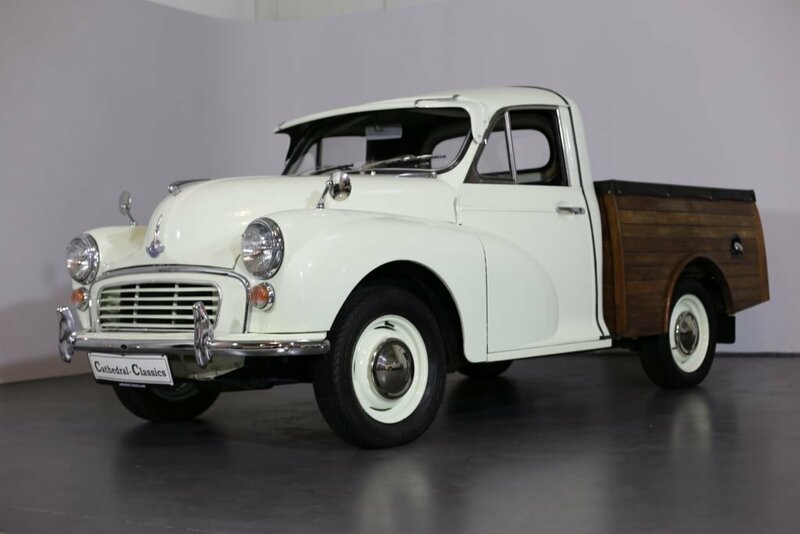 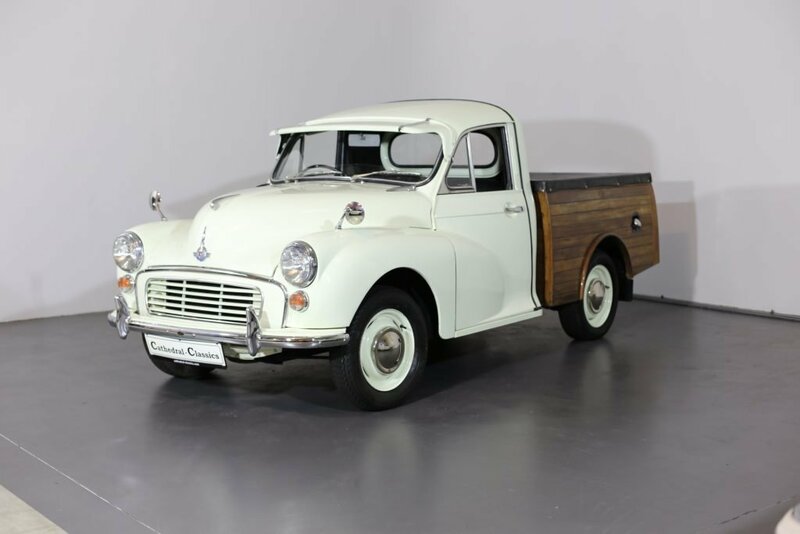 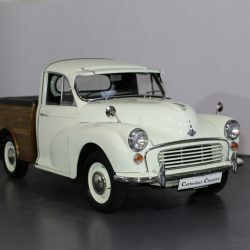 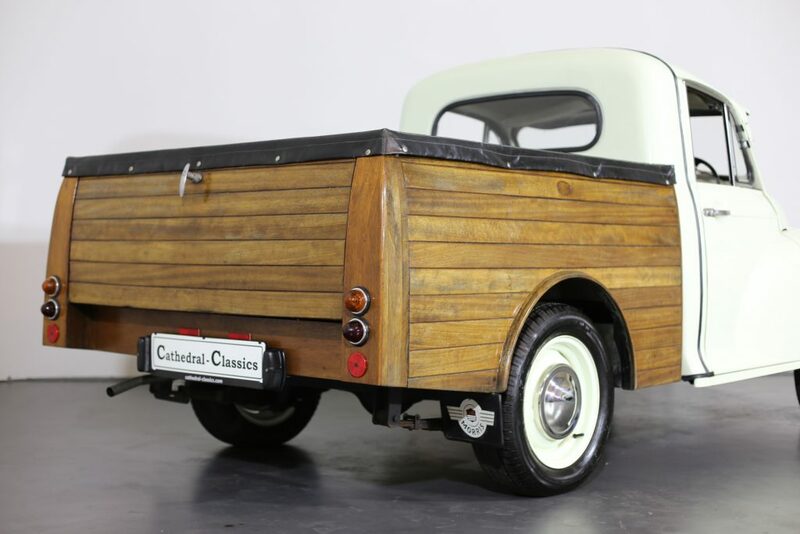 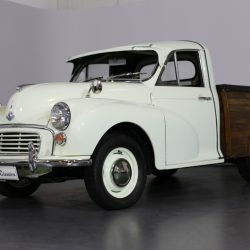 A unique Morris 1000 8 cwt Pick-Up Truck with bespoke cedar wood pick-up bed. 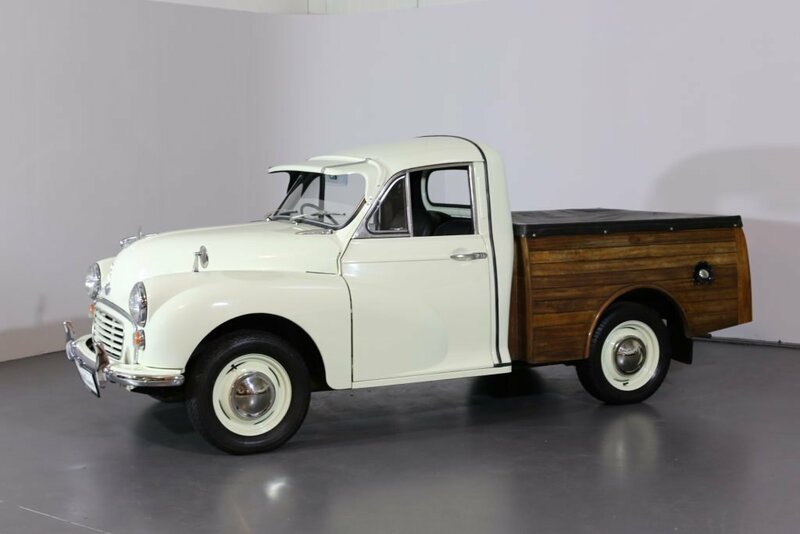 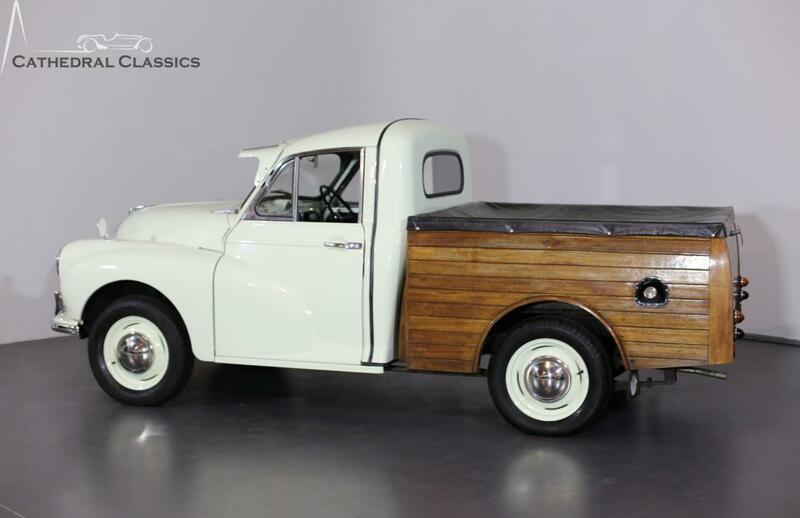 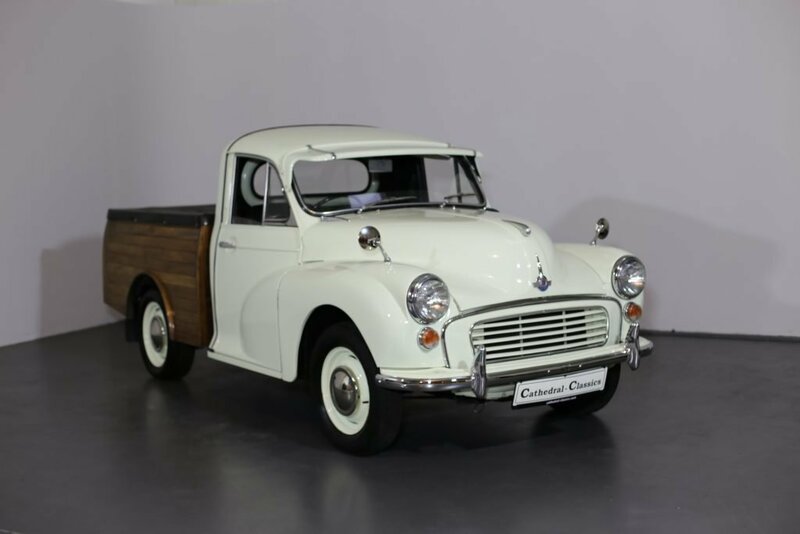 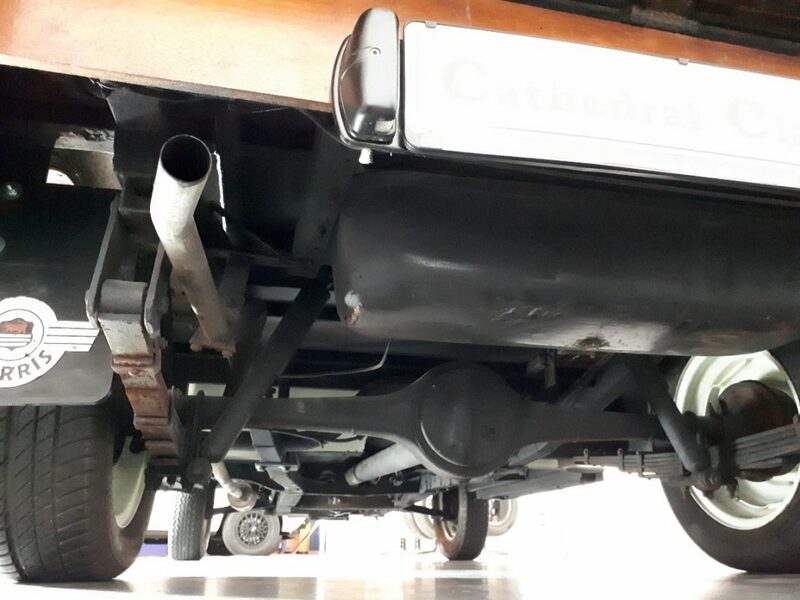 HISTORY FILE – Cathedral Classics are delighted to offer this charismatic restored Morris 1000 pick-up truck with 6 owners from new. 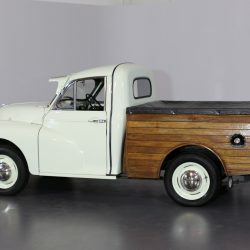 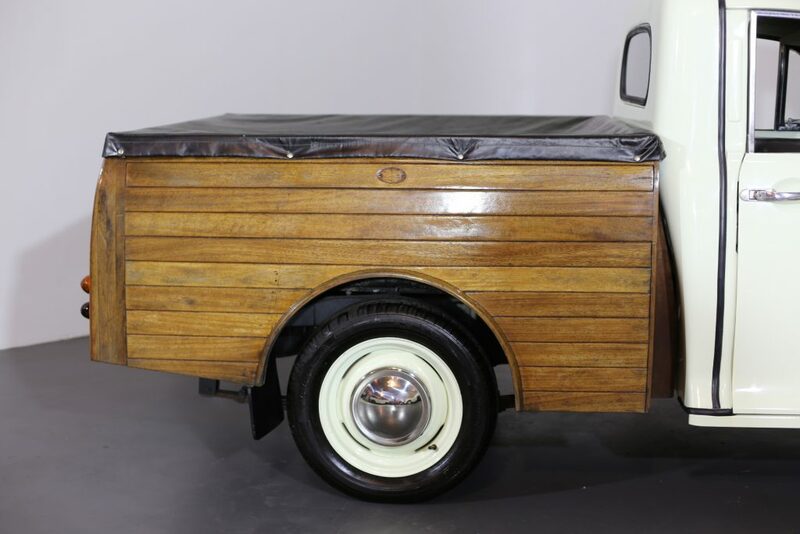 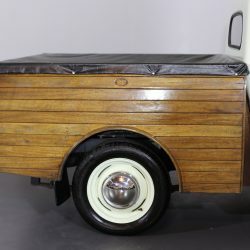 The perfect advertisement vehicle for your company, this example was completely dismantled essentially to allow the comprehensive work to begin at the unique wooden rear. 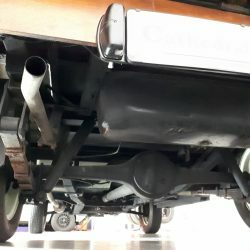 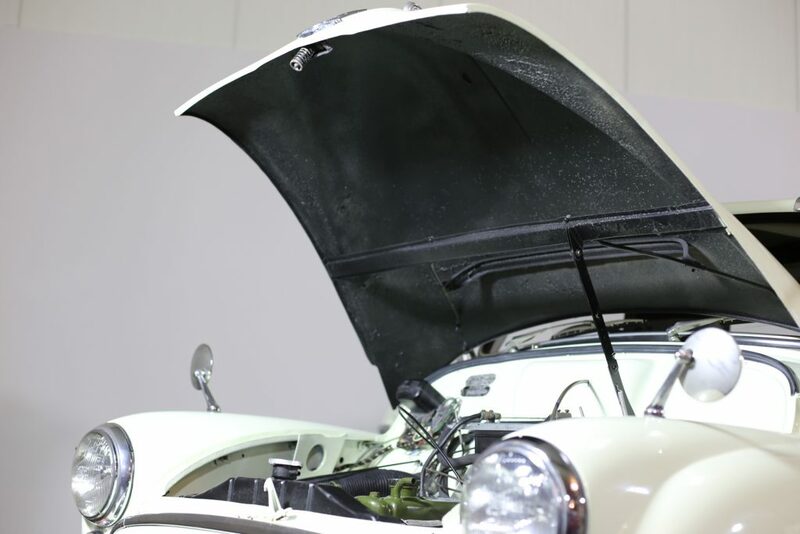 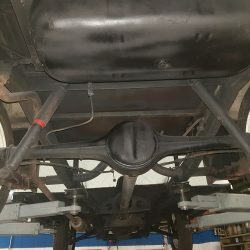 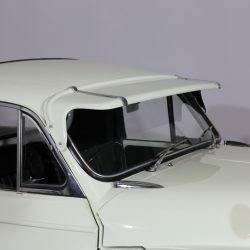 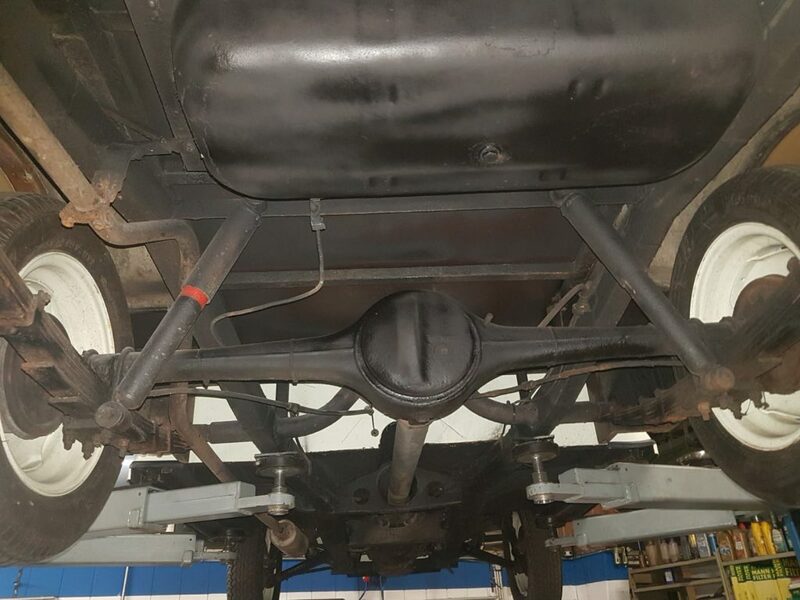 However, once started, the work then quickly stretched to include new: front wings; replacement bonnet; new floor pans; inner and outer sills; new chrome where necessary. 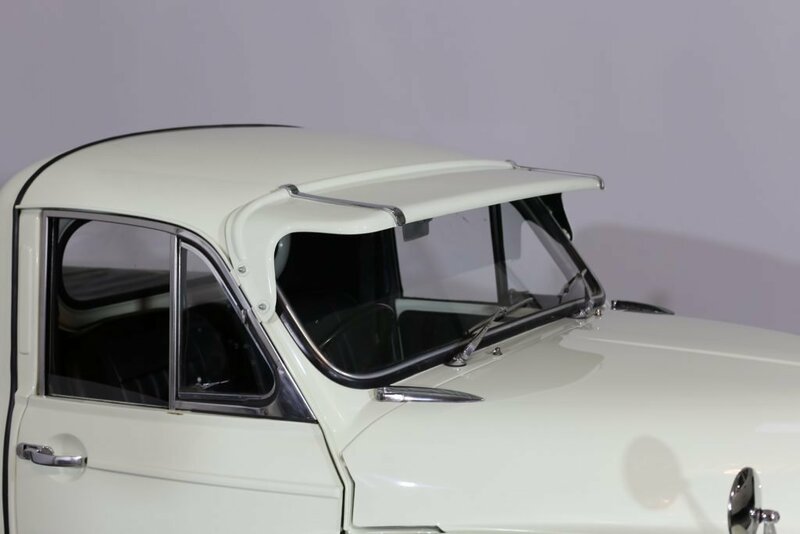 As with any restoration, it very rarely stays within the original vision boundaries, and this particular venture was no exception. 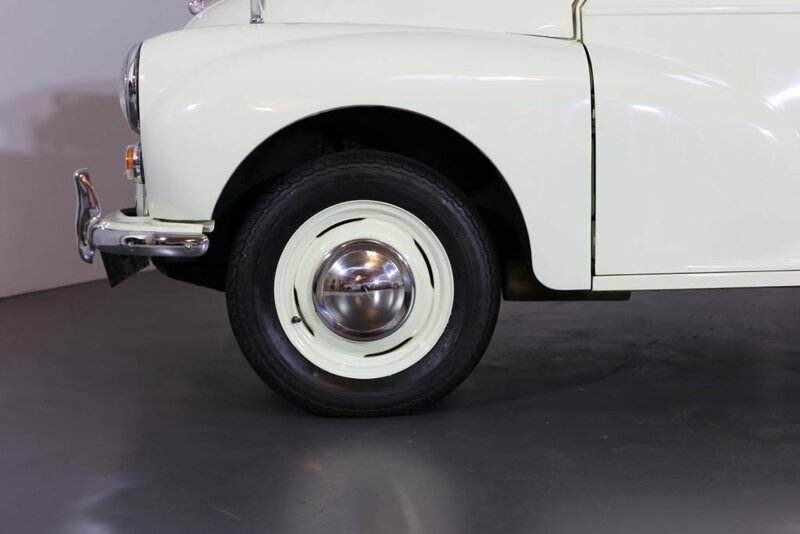 Part of an honest and varied private collection, it’s become just one car too many. 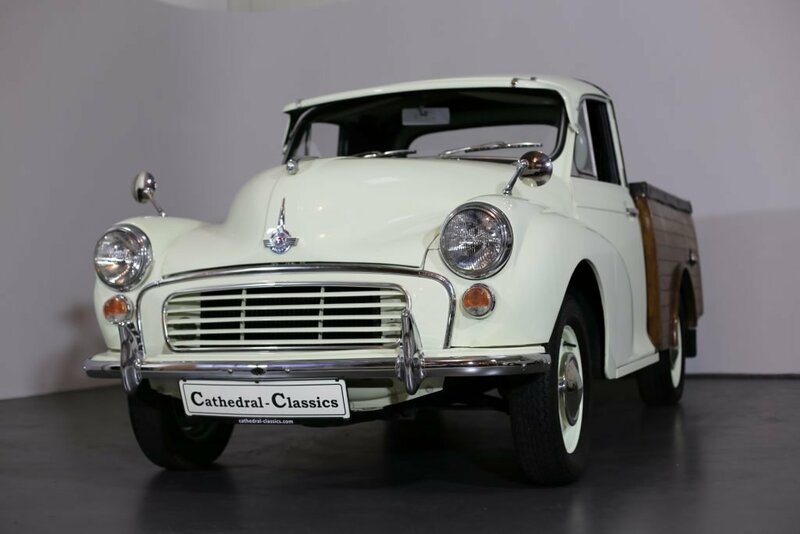 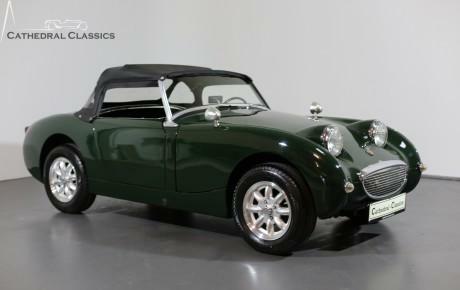 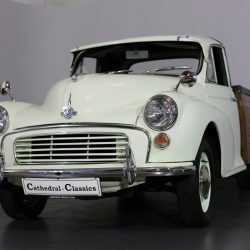 Cathedral Classics are delighted to offer this unique and charming vehicle to the market place. 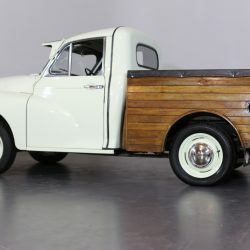 EXTERIOR – Painted in the last 12 months in Snowberry white, the body was completely taken off during the process, culminating in an even finish which contrasts superbly well against the unique wooden flat-bed rear. 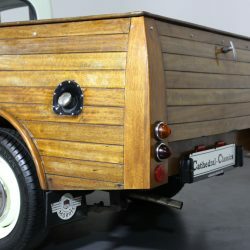 Fitted by a previous owner master carpenter, the vehicle was ostensibly used for display purpose only to show off the quality of his work. 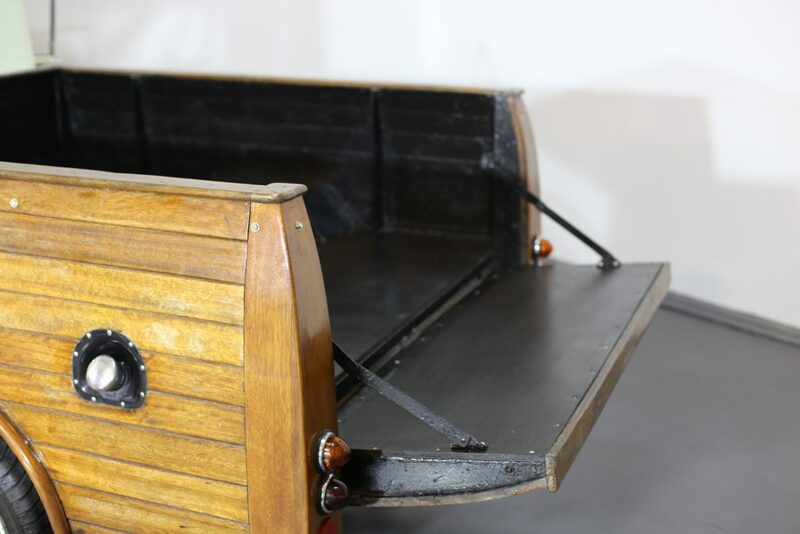 The hard waring red cedar wood has been treated with yacht varnish and is capable of withstanding all weathers. 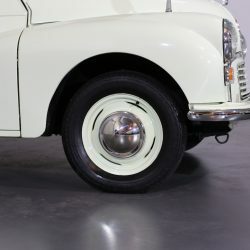 The result is remarkable and turns heads where ever it goes. 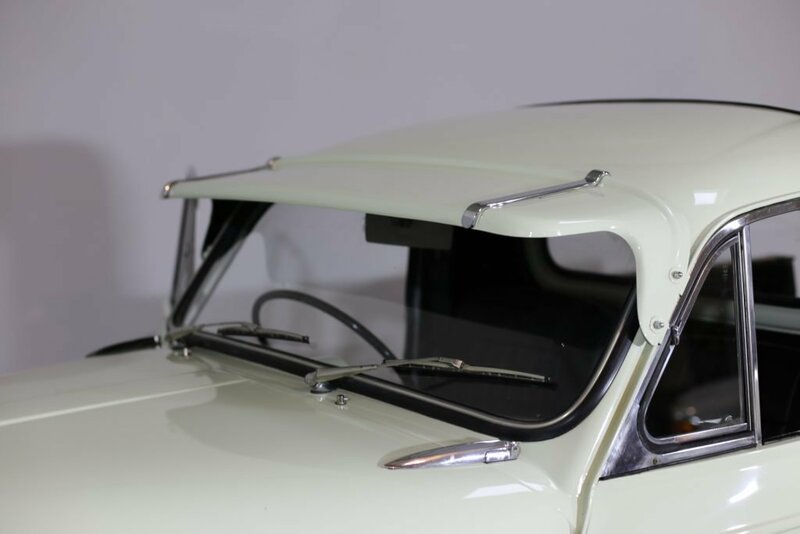 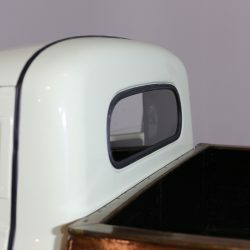 The rare external sunblind is a great addition to the restoration and can of course be removed – should you wish. 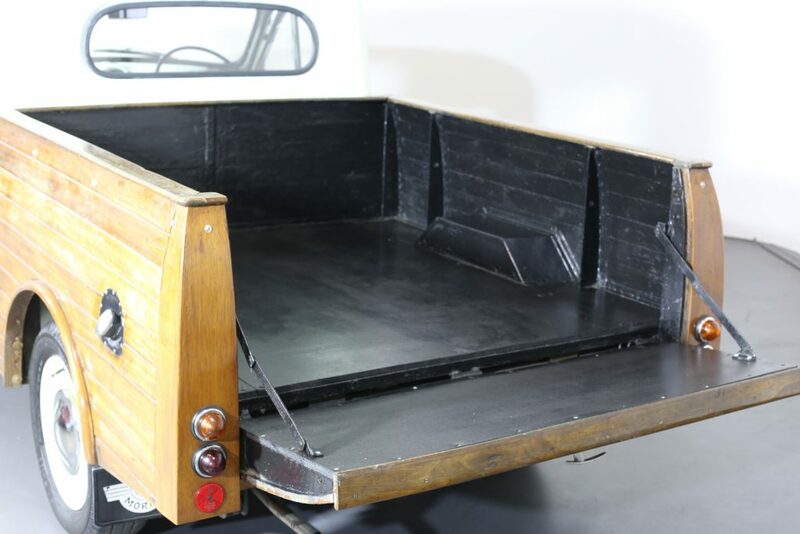 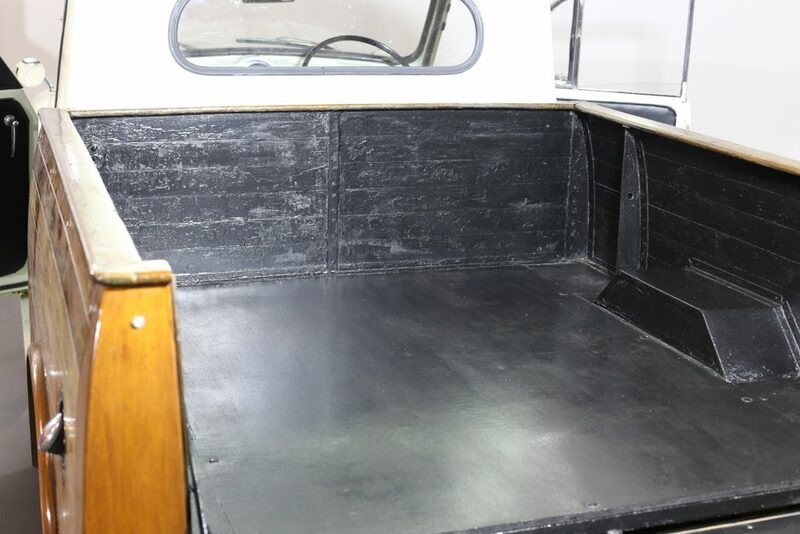 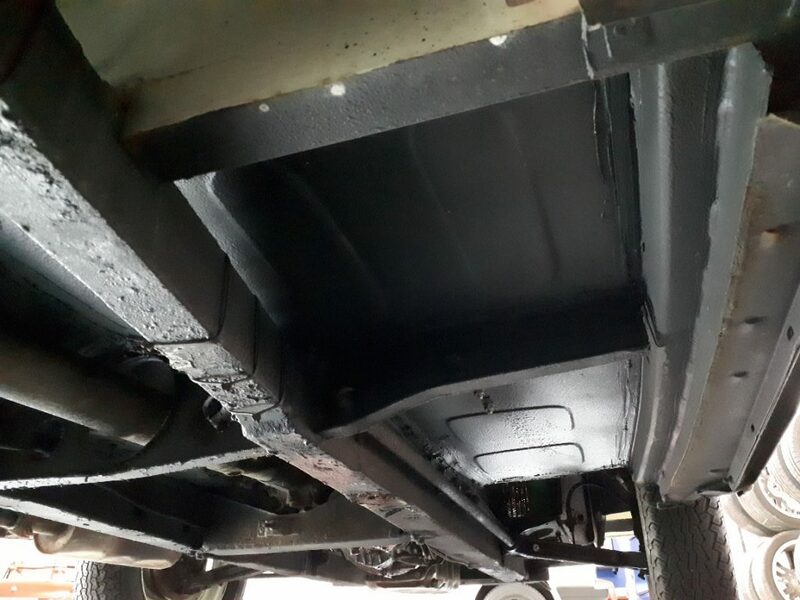 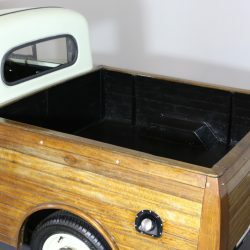 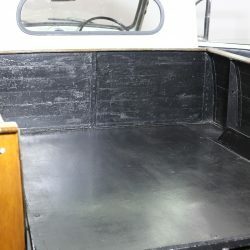 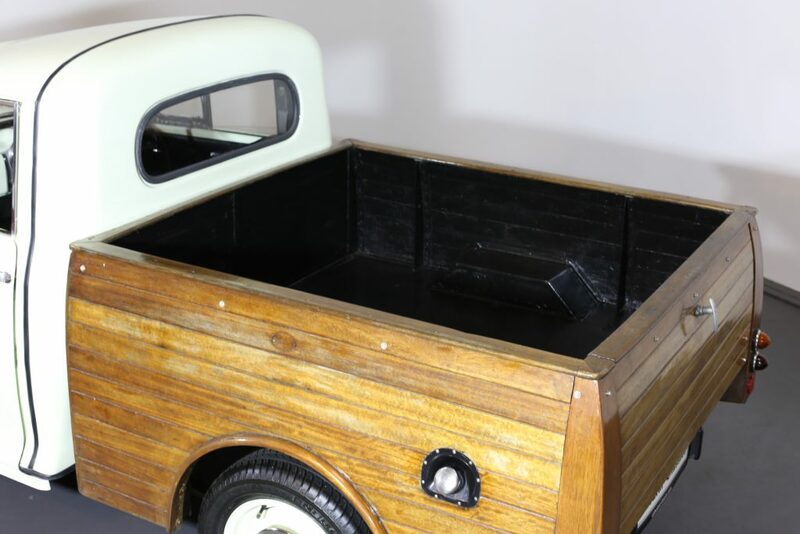 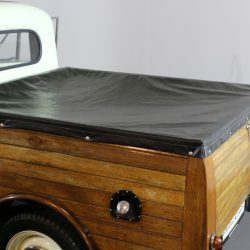 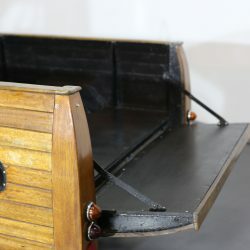 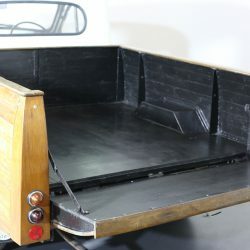 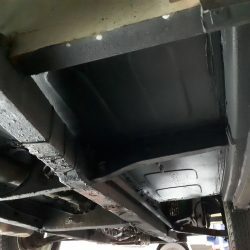 The inside flat-bed area is finished simply in mat black paint and is a sensible practical result. 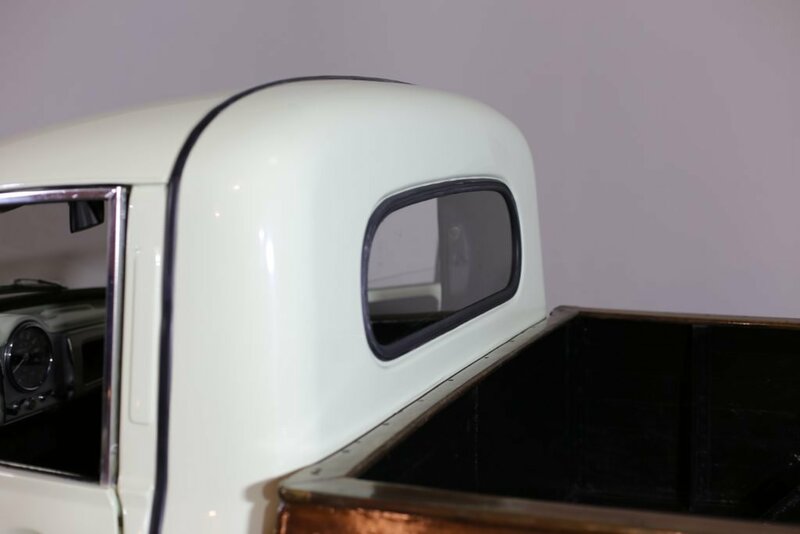 The rear is protected with a bespoke fitted vinyl cover. 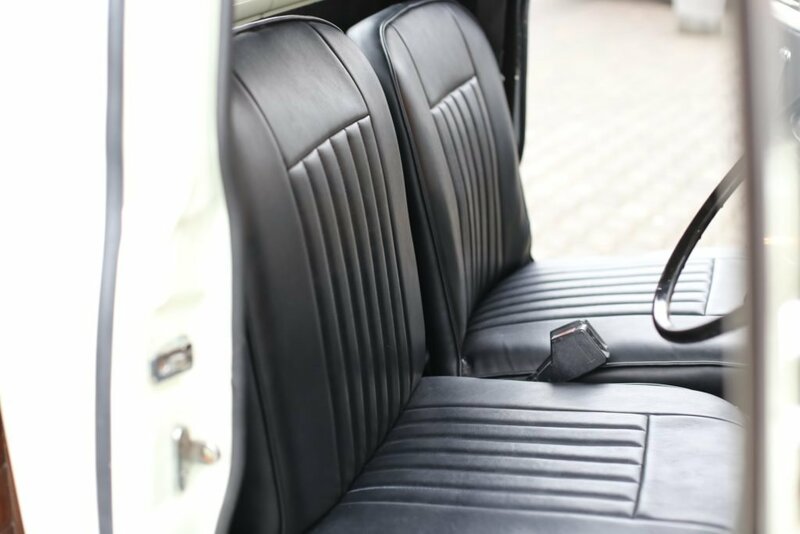 INTERIOR – Make no mistake, the interior region in these cars is tight - to say the least. 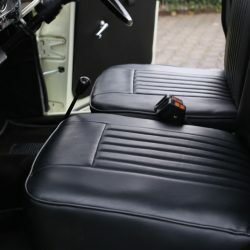 The spartan environment was produced with function in mind and certainly not for long journeys. 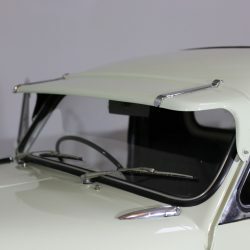 That said, it does have an element of wonderful charm - for a small person! 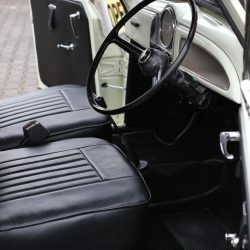 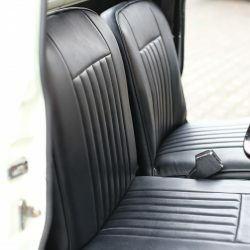 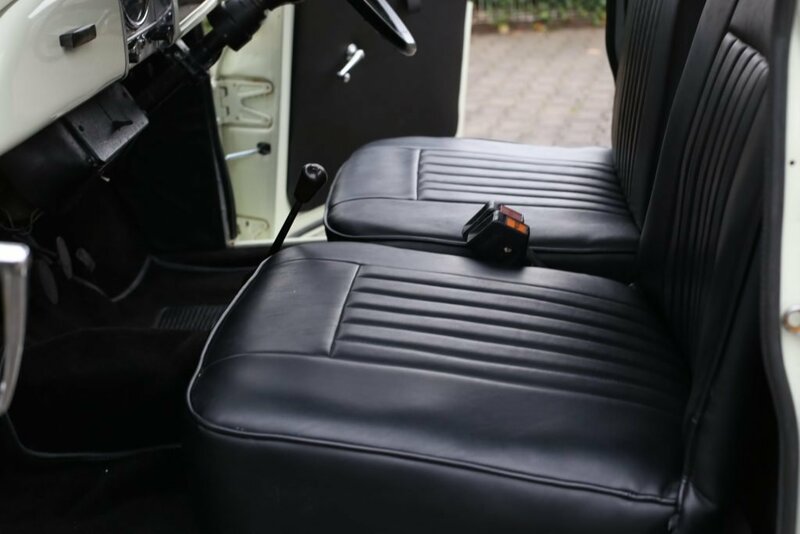 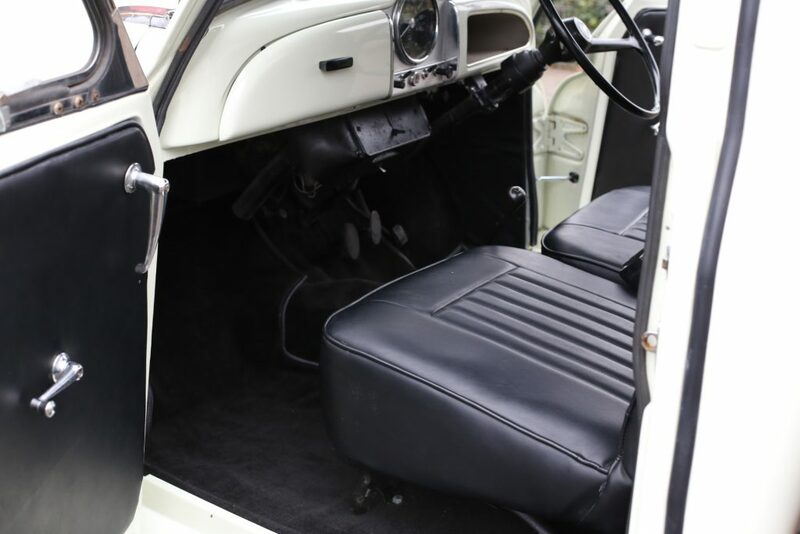 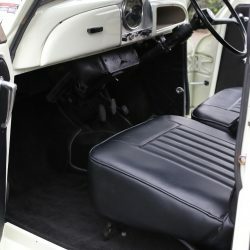 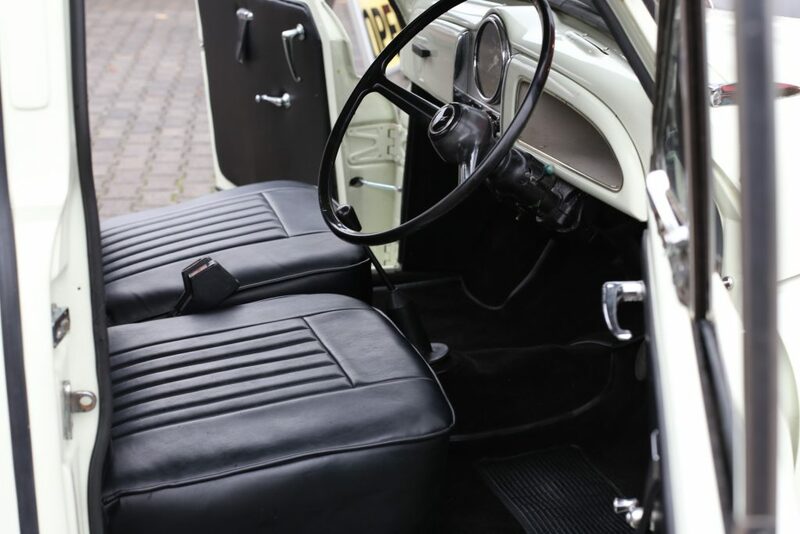 New black carpets combined with new leather seat covers, to a fixed seat position, have all added to this delightful restoration. 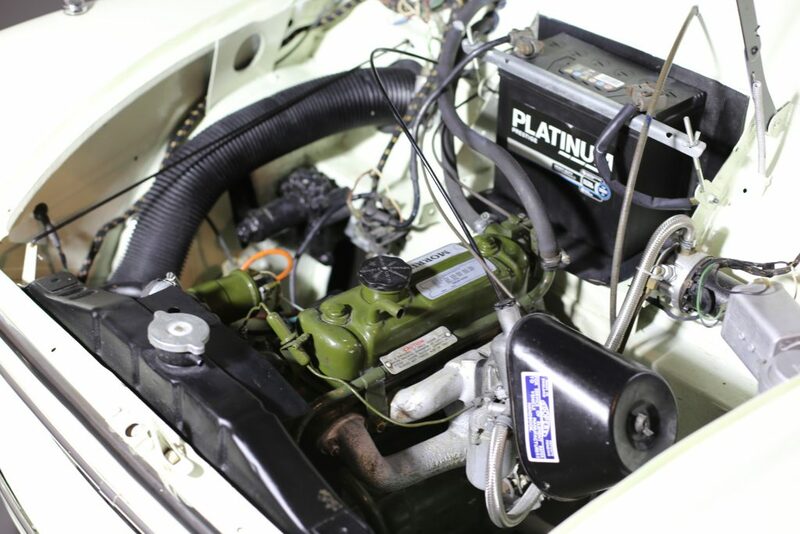 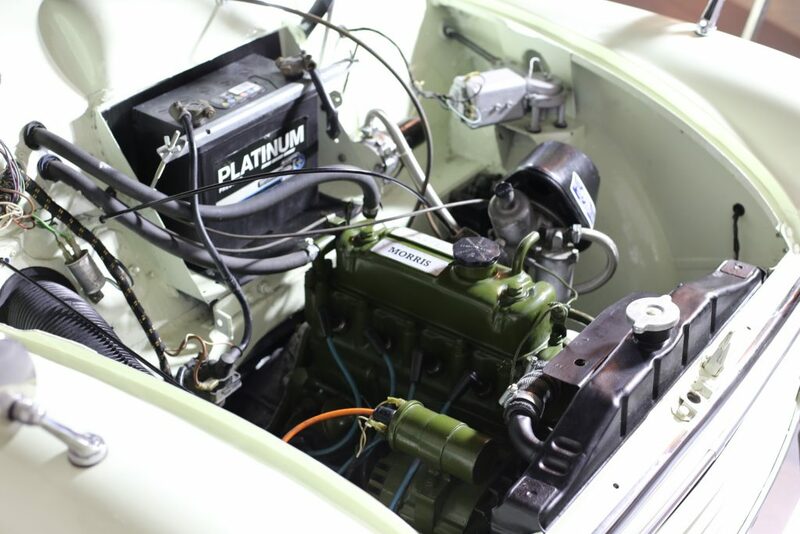 ENGINE & TRANSMISSION – The robust little A Series 1098cc engine was completely removed and painted during the restoration and body spraying process. 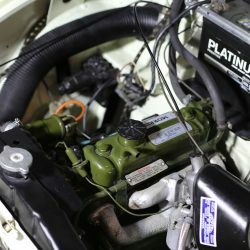 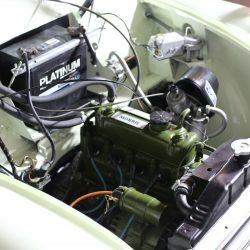 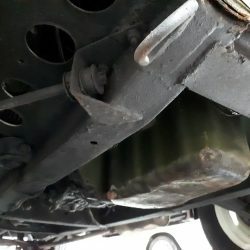 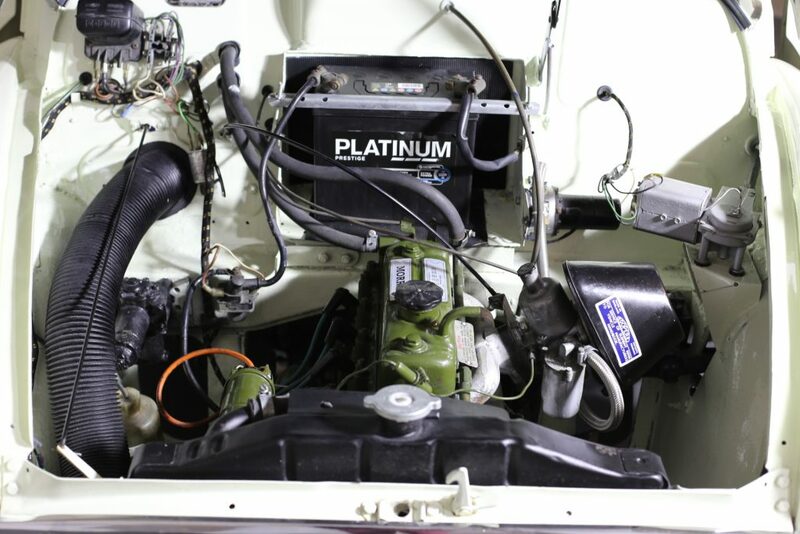 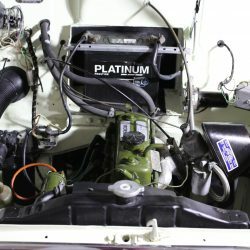 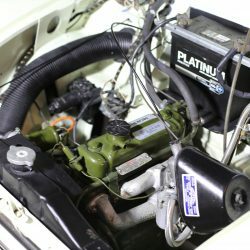 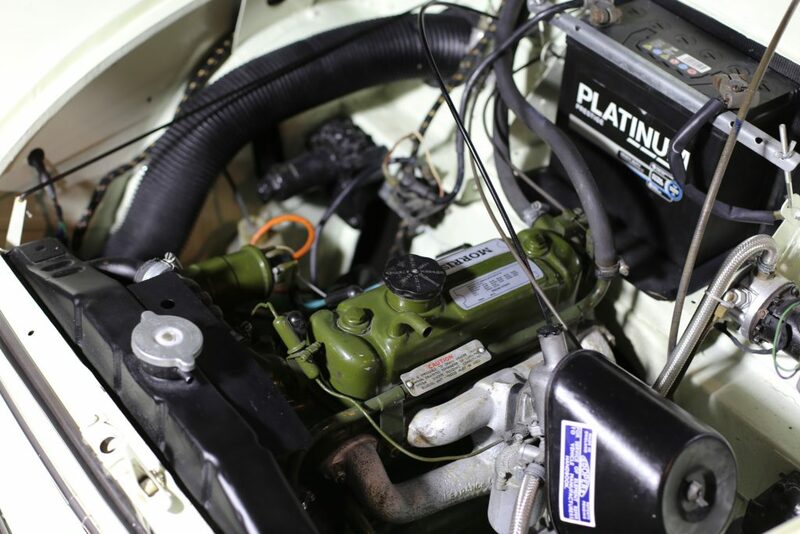 The result is a clean, very well presented engine bay which matches the overall appearance of this unique little car. 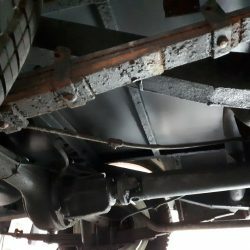 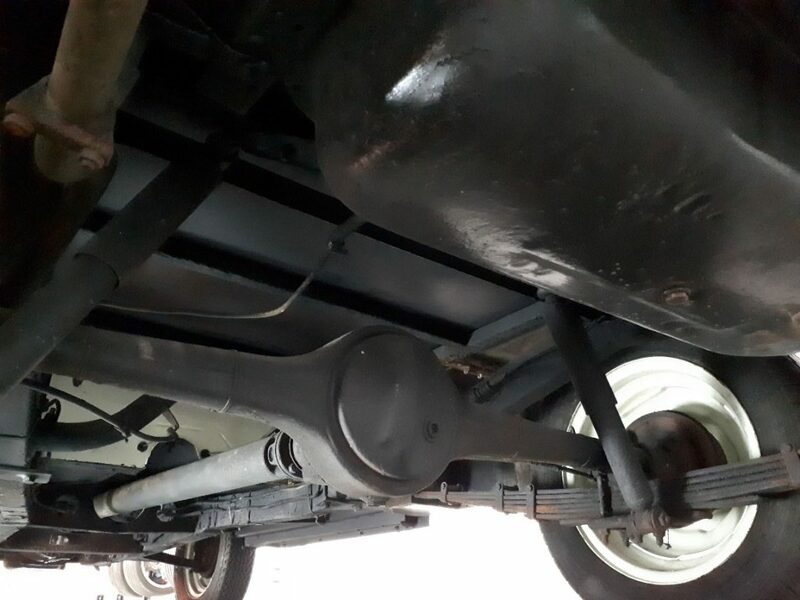 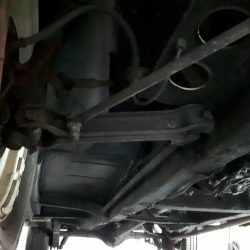 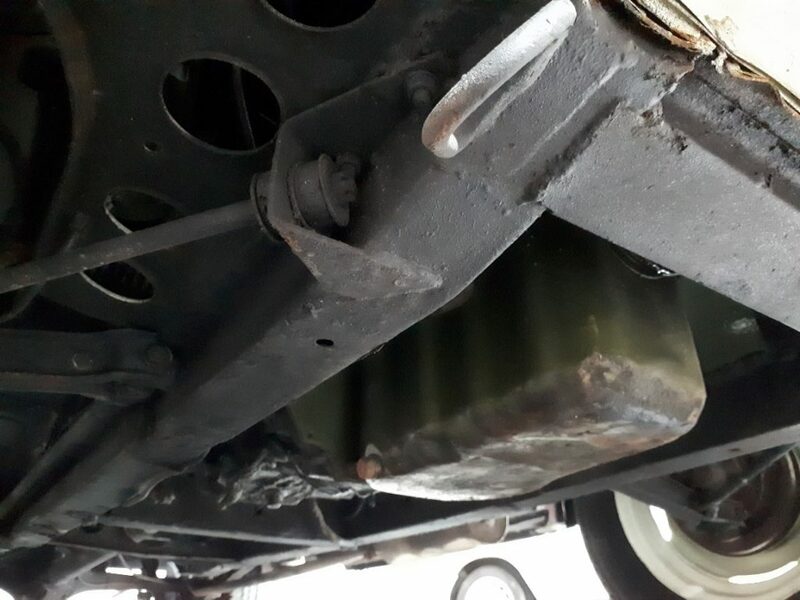 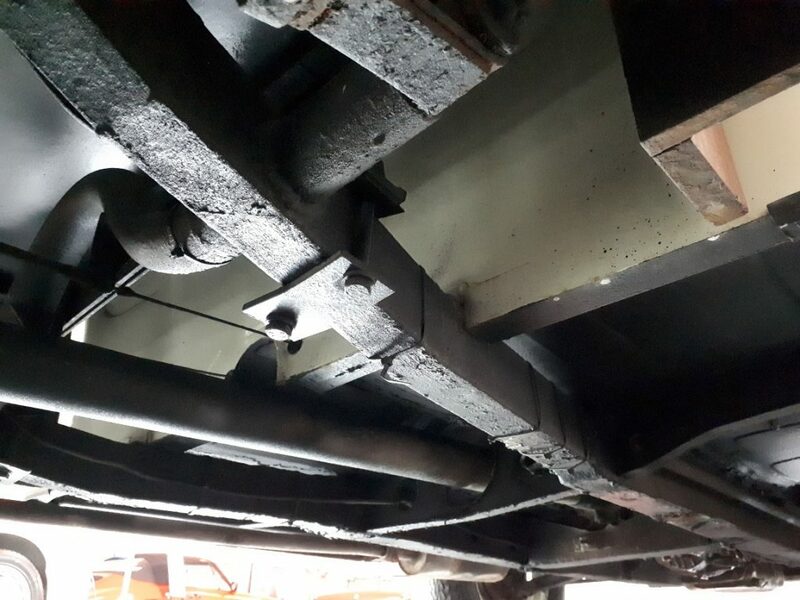 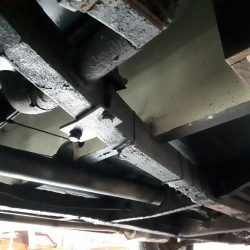 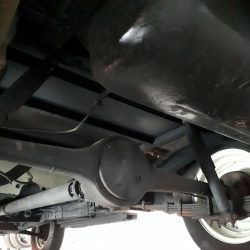 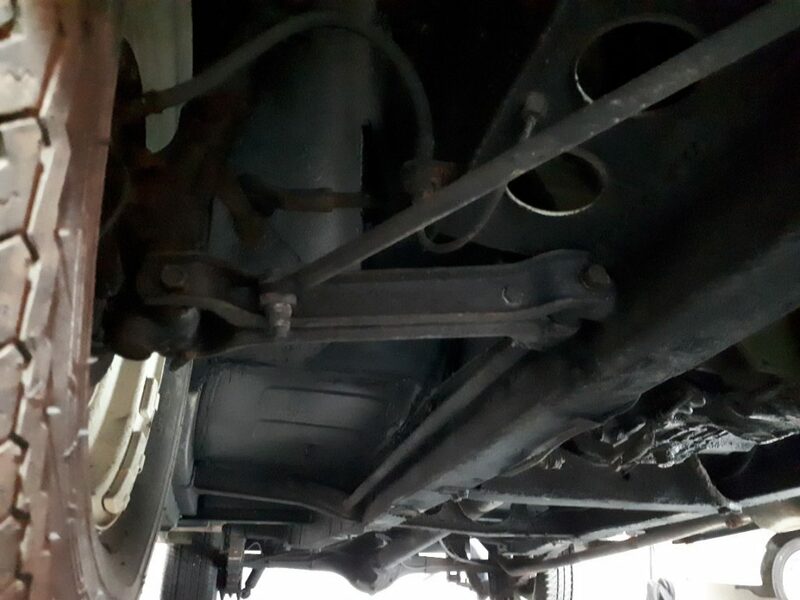 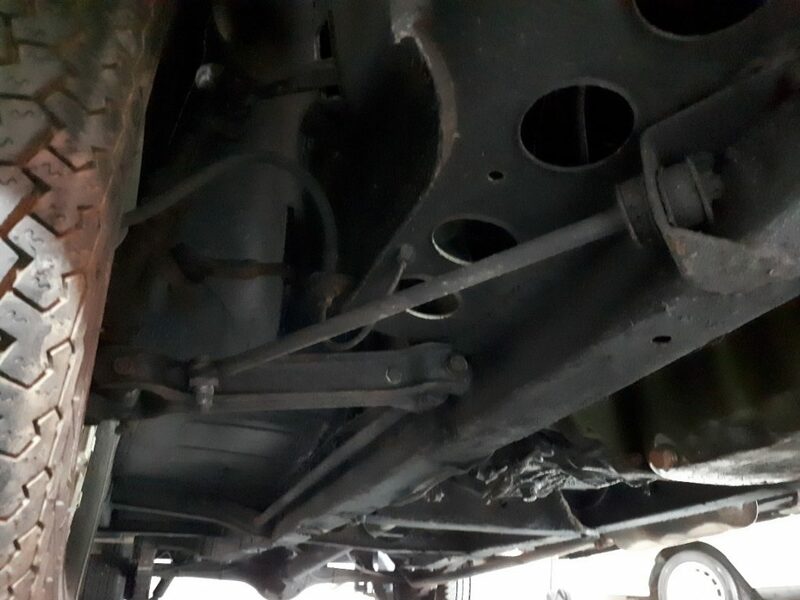 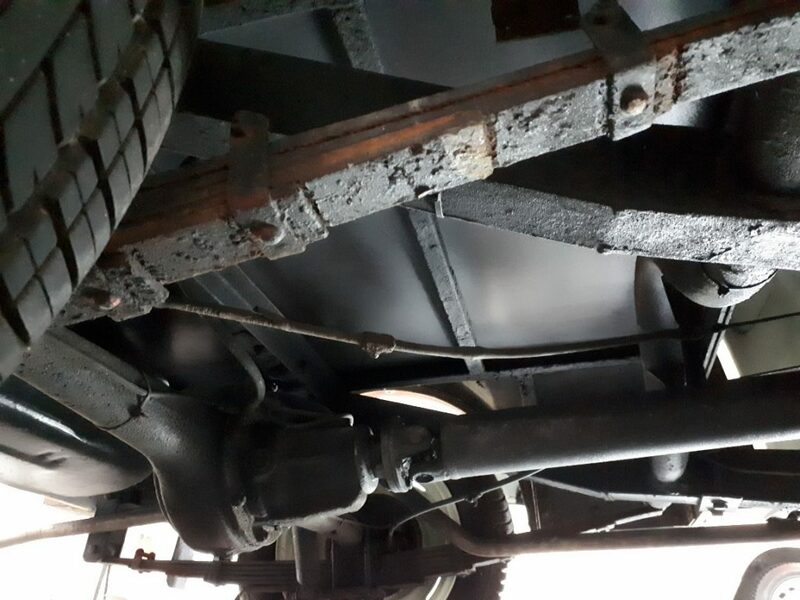 A new clutch was also fitted during the restoration. 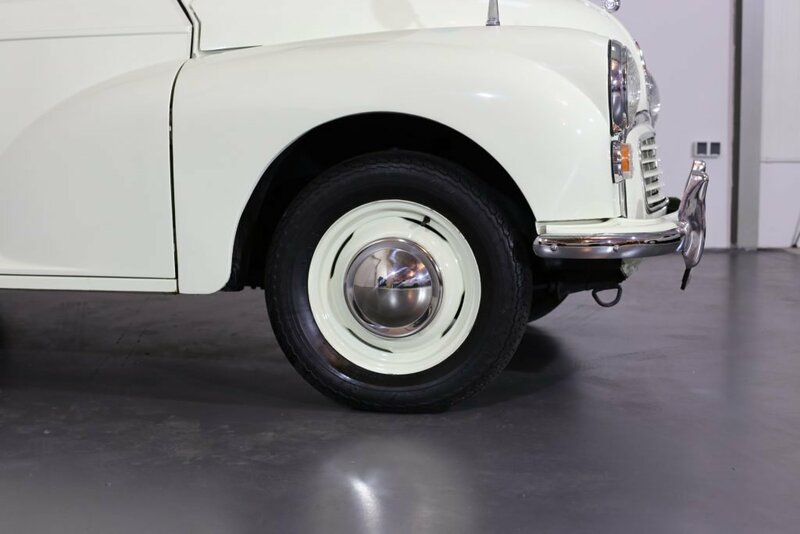 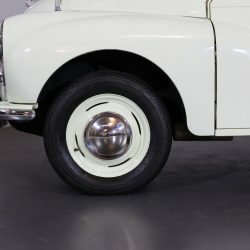 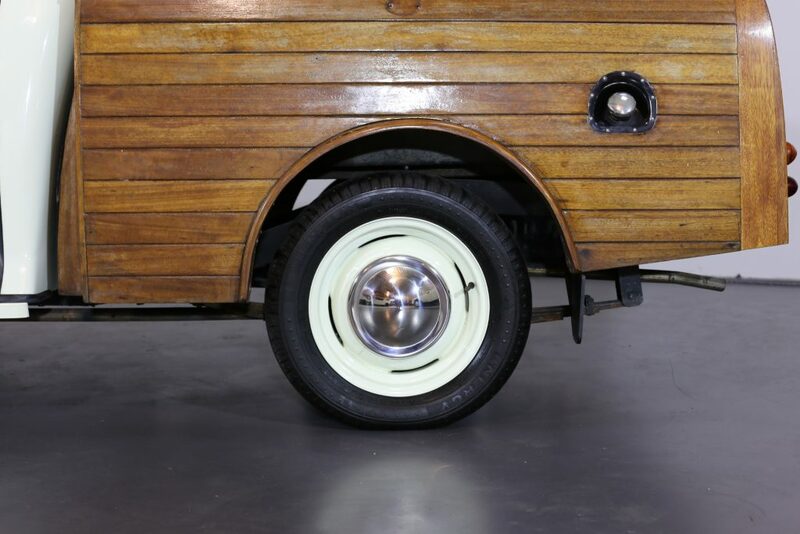 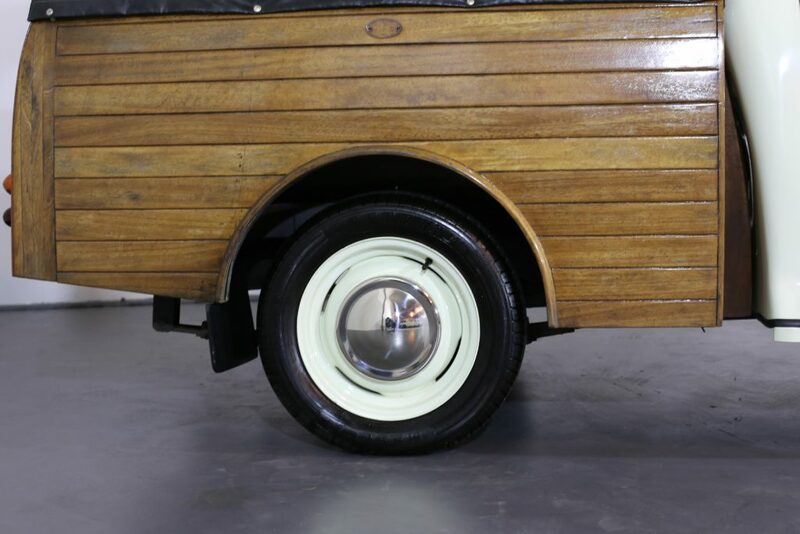 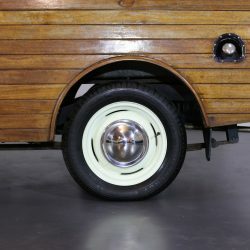 WHEELS, TYRES & BRAKES – Period wheels are painted in the Snowberry white body colour with gleaming chrome hubcaps. 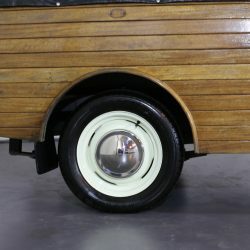 Two spare wheels are also available with the car. 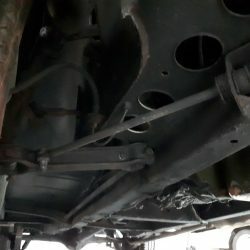 Brakes are all fine.